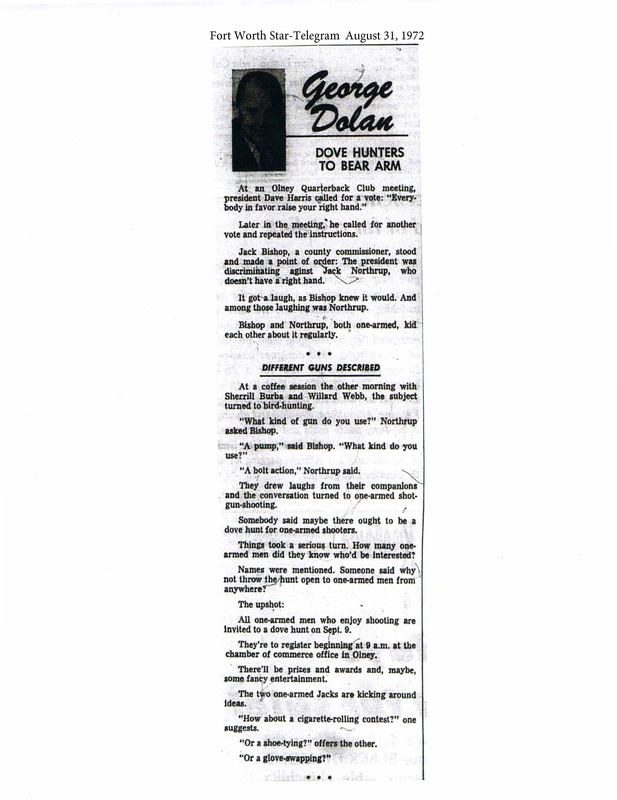 George Dolan, columnist for the Fort Worth Start – Telegram wrote this piece about the beginning of the One Arm Dove Hunt. For some this past weekend was a family reunion. For others it was joining a family. It was an overall awesome great time. Those of us that have attended the One Arm Dove Hunt in the past consider the other amputees, their families and many Olney residents as our extended family. Mr. Burleson, the U. S. Representative to Congress representing Young County in 1975 read this information about the One Arm Dove Hunt into the congressional record of July 23, 1975. This article was provided to the Olney Amputee Dove Hunt by one of Jack Northrup’s daughters. She found it in some old articles she had about the OADH. Thank you for sharing with us. We thought we would share this great article from The Wall Street Journal from 2006 about the One Arm Dove Hunt. Inspired by a Joke, One-Arm Dove Hunt Is a Tradition in Texas.